Ukraine may become the big market mover both in the financial and precious metals circles as well as for the dollar. Keeping an eye on what is taking place there is critical at this point. The documents recovered from Yanukovych have been posted on line for the entire world to see (yanukovychleaks.org/). The degree of conflict is great centered on the language. Yanukovych changed the national language whereas legal documents previously in Ukrainian were changed to accept Russian. This was part of the underlying uprising that the Ukrainians felt that their national identity was being usurped. This is why there was such a grass-roots core to this revolution. The Russian take on this is that the Ukrainians are now trying to outlaw Russian spoken by a large portion and mostly in the East. This is part of the reason I state that there MUST be a split to preserve peace. In the West, people are speaking Russian today and in the East many are speaking Ukrainian to demonstrate solidarity. But the political spin goes the other way. At the very least, hold MAJOR elections for each area and let them vote to stay as Ukraine of leave. Crimea is already saying they want to split and Russian soldiers have moved in to protect Russians no different from the USA does in such actions. 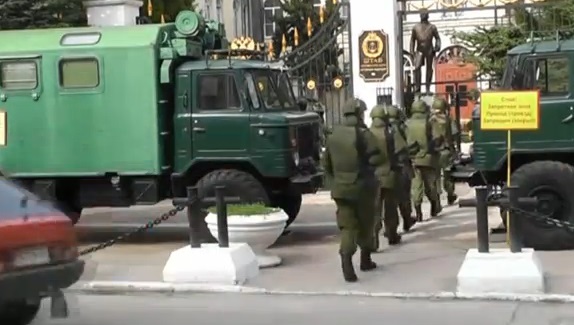 The strange thing is Russian soldiers have been moving into places like Yalta. This was posted at 5PM from Ukraine showing two troop carriers known as a “Ural” with Russian licence plates arrived in Yalta. There is an exchange with a man at the gate where he is asked why are Russian soldiers here and the response was he did not know. When he was informer they were from the Press, that ended any conversation. « Ukraine – The Spark for World War III?